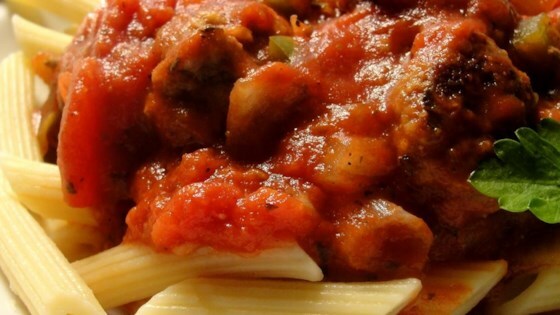 "A flavorful homemade recipe for those who are tired of sweet pasta sauces. Serve over your favorite pasta with a tossed green salad and crusty garlic bread." This classic tomato pasta sauce with meatballs is easy and delicious. this was a good one. I changed it a little. I used only sausage instead of adding beef. I served it on top of bowtie noodles with salad on the side. it was great.